The Blackhawks kicked off Monday morning by announcing they had re-signed gritty winger Daniel Carcillo to a 2-year contract at $825,000 per year. Despite Carcillo’s injury and suspension taken in a game against the Oilers, the move shouldn’t be a surprise to Blackhawks fans. When Carcillo’s season-ending injury was announced, Coach Quenneville spoke very positively about his play. Carcillo provided an important spark to the team in the first quarter of the season. He’s well-liked within the Chicago locker room, and can play better than most people give him credit for – he has enough skill that Quenneville played him more than once on the top two lines, where he helped generate goals. Up until the play that ended his season, it might even have been argued that Carcillo was on trajectory for a career year: he already had 11 points (2 goals, 9 assists) and was +10 in 28 games. His previous NHL best was 22 points/+5 in 76 games. He was also averaging 11:24 TOI in those 28 games, which is more than defenseman Sami Lepistö (25 games), or forwards Jimmy Hayes (25 games) or Jamal Mayers (70 games) receive. He had time on the PP; he skated on lines alongside Toews, Kane, Hossa, Sharp – and helped them score. Now, granted, between 16 minor, 6 major, and 1 “miscellaneous” penalty, Carcillo also spent his share of time in the box and occasionally took a penalty at an inopportune time. But as we’ve seen from the Blackhawks this season, the team has struggled on the PK all season, with or without him – they continue to lurk near the bottom of the standings, with a 78.4 PK%, good enough for 26th in the league. Chicago’s power play has been better as of late, but fans shouldn’t focus too much on the team’s placement in the PK standings any more this season. The Blackhawks sit at 82 points in the highly competitive Western Conference with just 12 games remaining – and the majority of WC teams have 1 or 2 games in hand over them. The 9-game losing streak hurt the team badly and no doubt cost them home ice advantage for the playoffs. Based on current projections, it will take 92 points to get to the playoffs – the lowest bar for the Western Conference in several seasons. Chicago is on pace for 96, which means they need at least 10 more points to keep their hopes alive, just a .417 win percentage. They’ll want to stay on pace closer to .583% to hold on to sixth place, which would also see them likely draw the Dallas Stars as a first-round opponent. There really is no “ideal” opponent for Chicago out of those teams projected to finish in the top 8 (STL, VAN, DAL, DET, NSH, PHX, SJ); every single one of them has given the Blackhawks fits all season. On the bright side for the Blackhawks, the arrival of Johnny Oduya via the trade deadline seems to have settled down the blue line. Or perhaps it is the general defensive pairings that have shaken out due to injury in the past few weeks: Duncan Keith reunited with Brent Seabrook; Oduya paired with Nick Leddy; Dylan Olsen paired with the fresh-off-IR Niklas Hjalmarsson. Olsen was actually looking solid when paired with Sami Lepistö, and who has now been removed from the D-man merry-go-round due to sustaining an injury in the last game against the Blues. Hjalmarsson’s TOI has been low the past couple games due to being fresh off an injury; as his conditioning improves, perhaps it will mean that Coach Quenneville peels some of the minutes off his top pairing (Keith/Seabrook), allowing them to get a little rest as the playoffs approach. In good news for the Blackhawks, team captain Jonathan Toews has been skating again and reports are that he is feeling good after workouts. However, he is still testing positive for some concussion symptoms, and is not yet cleared for contact skating. The very earliest fans could hope to see him back is for the Stars or Capitals match ups this weekend; next week’s Blues or Canucks matchup is looking more realistic at this point. On the bright side, Toews will be well-rested going into the final home stretch and the playoffs; no doubt a lot of minutes will be asked of him. After an excellent start to the season and perched atop the standings mid-year, it seems remarkable that once again, the Blackhawks must fight tooth and claw in the last games of the season to hold on to a playoff berth. In the month ahead, Chicago will face a variety of potential Playoff opponents: the Blues and Predators twice, the Stars, Caps, Canucks, and the Red Wings, not to mention the Devils. Either the gauntlet will polish and ready them for the post-season, or the Blackhawks may face another early exit. 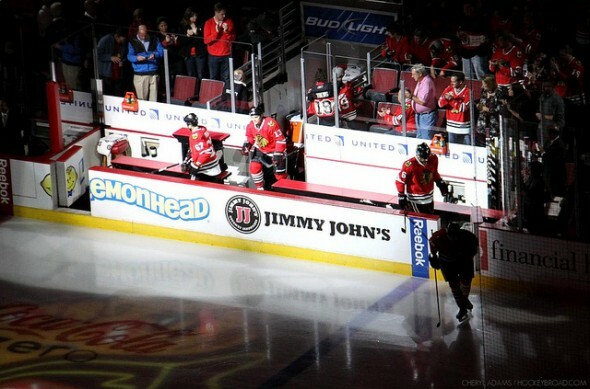 The Blackhawks will face off against the St. Louis Blues at the United Center on Tuesday, March 13th at 7:30 p.m. CDT.